Hello crafters -- Lorrie here and today, I am " blog hopping" with the Designer Crafts Connection and Etchall! 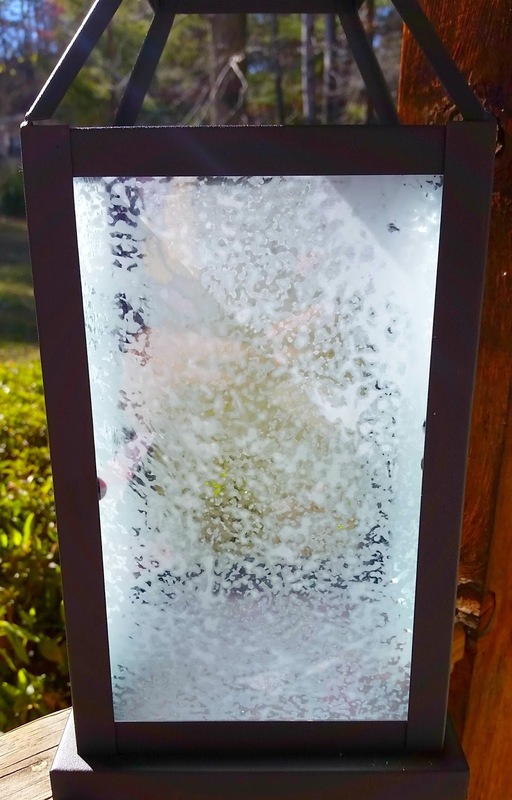 We are bringing you some really cool etched glass crafts using Etchall, a glass etching cream that is like no other. 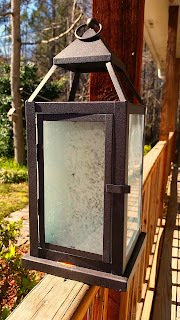 I will show you how to turn plain glass into frosted "antiqued" glass using nothing but Etchall and a sponge! Most people use Etchall with stencils to put words or designs on their glass pieces. However, I wanted something a little different. 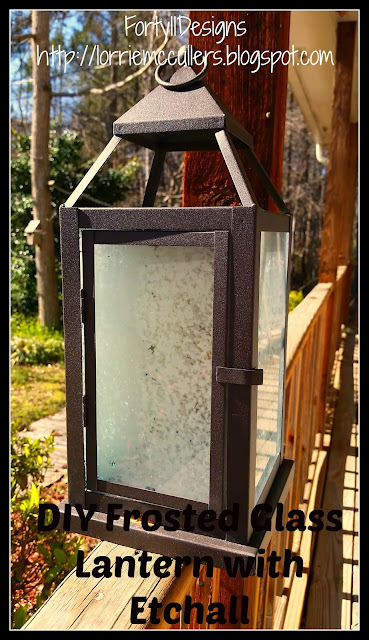 I wanted to give my glass an overall frosted effect so that when a candle is put inside, the candlelight is more diffused and looks a little softer. I found out that is very easy to do with Etchall Etching Creme. 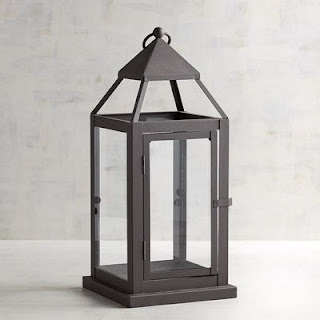 I started with a metal "Landen" lantern from Pier 1 Imports. 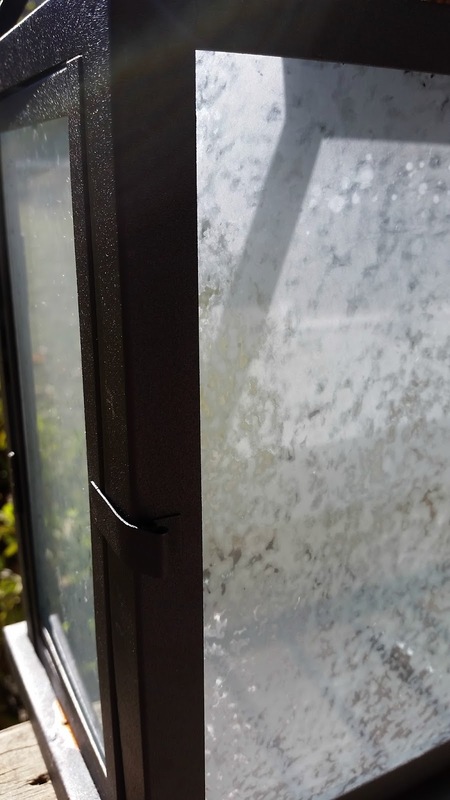 It features glass panels set in black metal. Next I removed all of the panels from the lantern and cleaned them with alcohol and a paper towel. 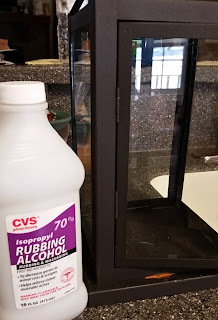 It's important to clean the glass with alcohol instead of glass cleaner before you begin etching. Alcohol gets rid of all dirt and oils; if you use glass cleaner, it may leave behind residue that will resist etching. I then poured out about 4 tablespoons of Etchall etching creme onto a piece of wax paper. Don't worry about pouring out too much -- Etchall is reusable so any excess you may have can be placed right back in the jar to use again! To give the glass a frosted look, I used a sponging technique. When using Etchall, make sure you use a plastic sponge (I used a dish sponge from the dollar store). I dipped the sponge into the Etchall and then "pounced" the sponge on the wax paper to get creme into all of the little holes. Once the sponge was loaded with Etchall, I pounced the sponge onto the glass. I made sure to pounce straight up and down; any side to side movement will smear the etching creme and won't give the mottled appearance you are looking for. 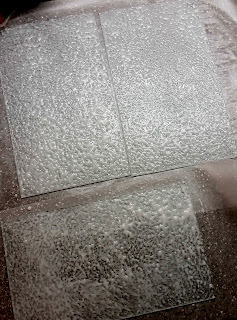 These were my panels after sponging. The creme will have an uneven appearance when using the sponging technique -- that's OK! 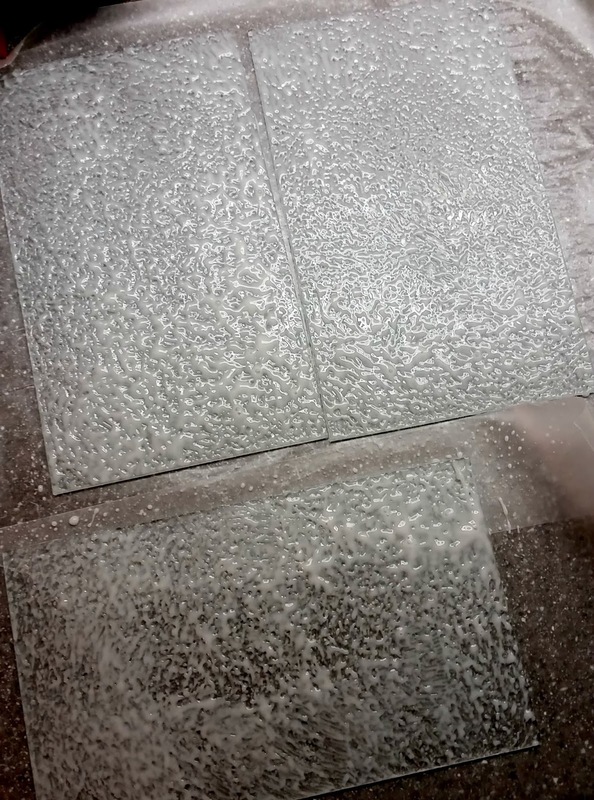 That's how your glass gets that cool frosted effect. 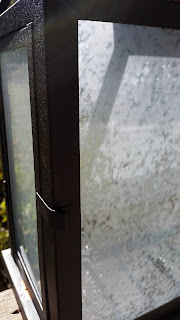 I then waited about 20 minutes before washing the glass panels under warm running water to remove all of the Etchall. Finally, I dried the panels with a paper towel and put them back into the lantern. Isn't that absolutely gorgeous? I love how the glass now has almost an antique look to it. 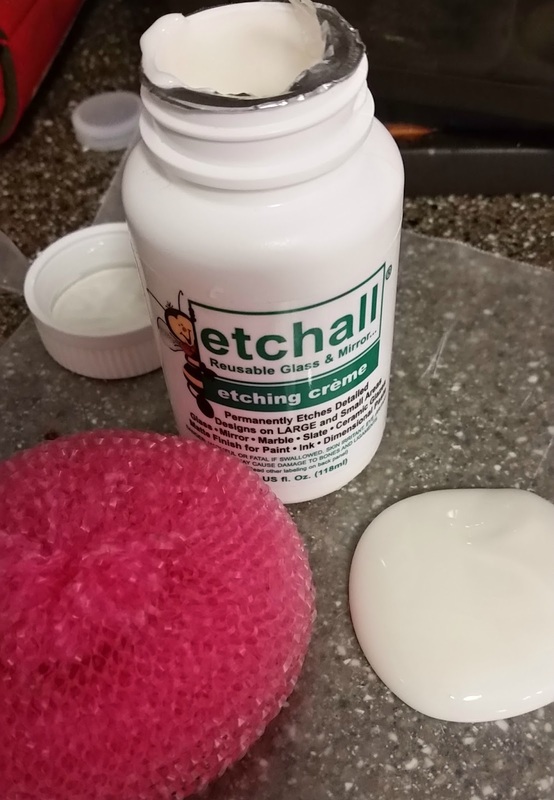 And it only took about 30 minutes to go from plain to WOW, and I was able to do it in my kitchen -- Etchall doesn't have a strong smell like a lot of other etching creams so I didn't have to stink up my house! I hope y'all enjoyed this little project. It's really easy, so go out there, grab some Etchall, and start etching! CLICK HERE to go to the Designer Crafts Connection blog for a coupon code for a discount on Etchall and to see links to all of the other blogs in this hop! love the technique you used. Thanks, Steph! I am pleased with how it turned out. Thanks, Tammy. I tried to think outside the box on this one! Nice project! I have to try this technique now. Thank you, Terry! It was so easy and gives it such a cool look. That is very cool! I am going to do that on a lamp! Thanks, Marilyn! It was so easy to do and I love the way it turned out. This would look great on a lamp! Clever idea using the sponge! Thanks, Tanya. I figured I had done etching with stencils before so I wanted to try something new. Lorrie, This is really great. I love how you used the sponge technique. Very nice! What a great effect! WOnderful project! Copyright 2008-2017. Powered by Blogger. New Cricut Bags and Totes PLUS a Sale! Cricut Supplies Mystery Box On Sale Now! March Cuttlebug Mystery Box on Sale Now!